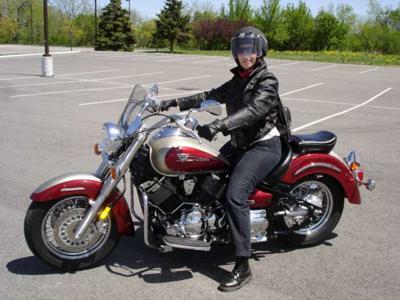 My wife, Jackie........so proud of her new V-Star! Tough not to smile on a bike this pretty! There's nothing super special about this shot. I took it with a compact Canon digital in a nearby parking lot here in St. Catharines where Jackie was practicing figure eights on her new (old) 2004 Yamaha V-Star Classic. She's obviously having the time of her life, and just raring to hit the road as soon as she gets her turns under control!